Rubbish collection and disposal is an important feature of any urban society. Around the world more people today live in urban than rural communities. Our way of life today generates far more rubbish than ever in the past, so the health of a society can be judged, in some degree, by the effectiveness of its waste disposal. When we moved to Brussels, the system of rubbish collection here was a mystery. As ever in Belgium, it was difficult to find out what the system was and how to conform to it. 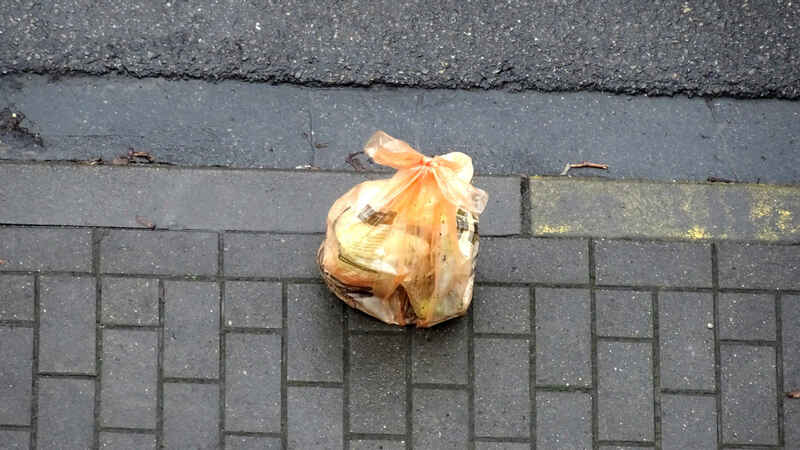 Massive piles of big, white and coloured plastic bags appeared on the pavements, piled around trees and along the kerbsides on certain days. At first there seemed no rhyme or reason to this, and we had no one to ask and nowhere to find an explanation. But clearly there was a system. Soon enough, waste trucks made their rounds. Teams of fit young men in bright vests gathered up (most of) the bags and tossed them into the trucks at speed and soon the streets were more or less empty again. Except, that is, for the bags the teams ignored and the content of the bags that had split open. Scatterings of orange peel, wet cardboard, chicken bones, polystyrene trays, plastic cartons, drink cans and coffee grounds spread across the street. Later in the day – or the next day – street sweepers would come by and sweep up the scattered rubbish. (The rejected bags would be left.) All – almost – would be clean and tidy again for a day or so till the process repeated itself. By a combination of asking at Mrs SC’s place of work, making Internet searches, and observation, we eventually worked out the system. Green plastic bags are for garden waste. 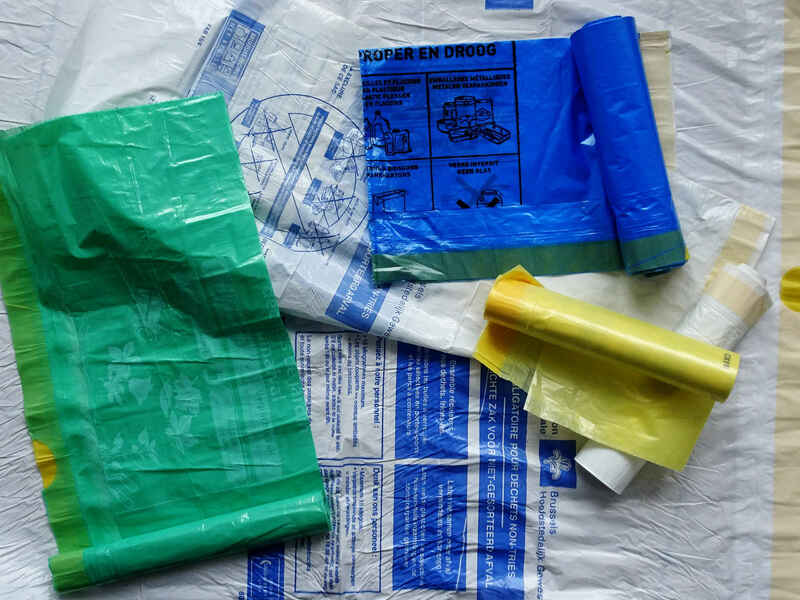 Blue plastic bags are for plastic bottles, drink cartons and cans, tin cans and metal. Yellow plastic bags are for cardboard and waste paper. White plastic bags were for everything else. You can buy all the bags – in rolls – from the local supermarkets, and these are the bags you must use. Other bags, bags you might use to carry shopping home in, or bags of other than the designated colours – these are the bags that get left behind. The official bags have the permitted contents printed on them, together with dire warnings about fines for non-compliance. In our neighbourhood, on our street – and it varies from neighbourhood to neighbourhood and street to street – the collections were: on Sundays green bags; on Mondays and Wednesdays, white bags; on alternate Mondays either blue bags or yellow bags. But now everything has changed! No, I exaggerate. Some things have changed. 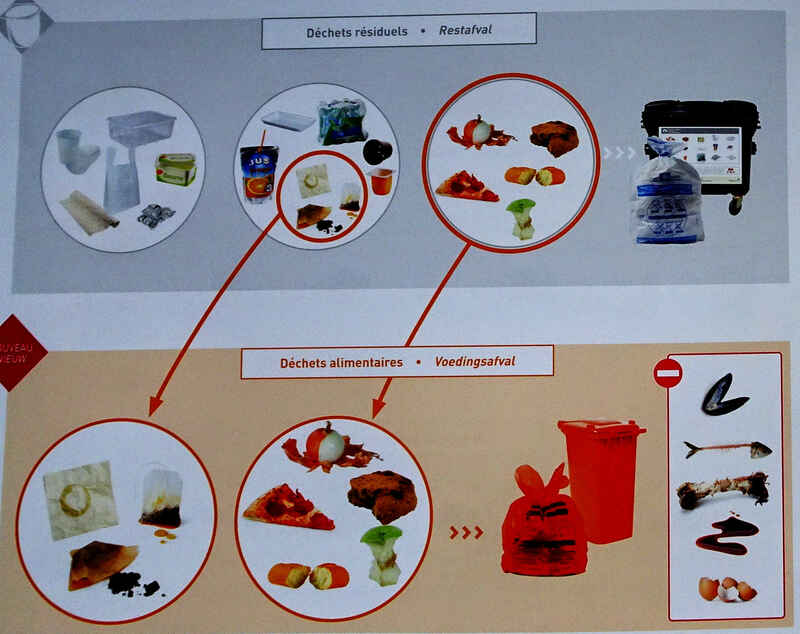 What has happened is that Bruxelles Propreté (“Brussels Cleanliness”), the organisation that seems to be responsible for rubbish collection, has discovered organic waste. Perhaps that’s unfair. Perhaps they were moving towards this all along. 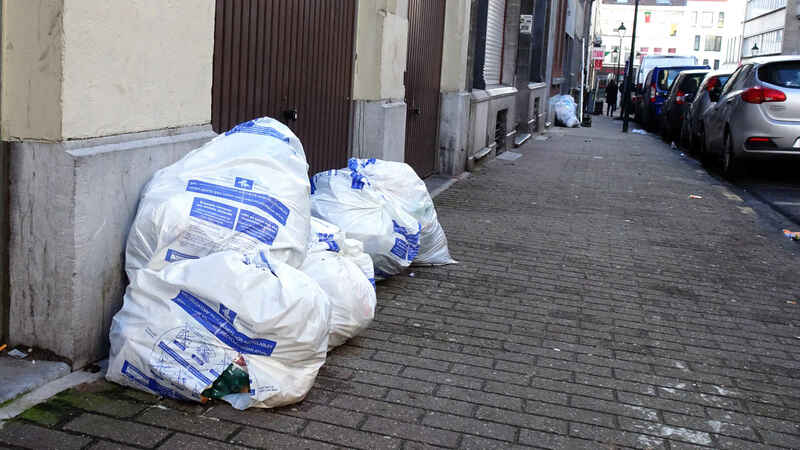 Regardless, from January 2017 Brussels residents are now expected to separate out organic waste for recycling from the rubbish we were previously dumping in the white bags. We have a new schedule for rubbish collection. And we have a new bag to add to our store. There are some curious restrictions. We’re not allowed to put bones, the shells of shellfish or eggshells into the brown bags. Those still have to be thrown out in the white bags the same as before. We received a brochure about the new system. For our street, the regular collection of the white bags is still on Monday and Wednesday mornings, and the bags still have to go out before 6am on Monday mornings (but not before 6pm on Sunday evenings). Our new brown bags, though, are to be put out on Mondays after 6am and before 12 noon. My first Monday back in Brussels was the 9th January, which means I hadn’t seen how things worked on the 2nd, the first Monday of the new system. Still, I was grateful to have a brochure at all. I even thought I’d managed to work out myself what it was saying. Even so, I put a few key phrases through Google to double check. OK, it looked like I was on the right track. So now I have a large bag of organic waste stored in the kitchen, and despite the low temperature in the kitchen, the waste is stinking. It’s definitely time to get rid of it. At 10 o’clock I went out with the brown bag. I put it on the pavement near the gutter outside our house. Then I looked up and down the street. I seemed to be the only person to have put out my organic bags. Was I too early? Had I misunderstood? I picked the bags up again and brought them inside, into the well of the house where there are dustbins that some of the residents use. Maybe there were brown bags stored there waiting to be put out later. So I took mine back out into the street and left it by the gutter again. At just about midday, as I had finished one phase of my day’s translation work, I got up to stretch my legs and went to the front of the flat. Out on the balcony overlooking the street. We’re four flights up here with a good view over the street up and down the hill. I looked down into the street. My brown bag sat there, alone and forlorn. I looked up the street and I looked down the street. Not a single other brown bag anywhere. Nobody had put out anything. Again I wondered whether I’d misunderstood. Had I been looking at the wrong timetable in the brochure? Was it the wrong day? The wrong time? I was worried, but mostly because I thought rats, cats, foxes or crows would try to get into the bags. (I’ve seen all of them – or their handiwork – at times over the past couple of years.) But I came back indoors and carried on with my work. At about 15.30, after I’d sent off my texts and was waiting to receive them back as a PDF for proofreading, I went a second time out onto the balcony. Everything was exactly the same. There was my bag on the pavement and nothing in sight up or down the street. I started a little to panic. I was thinking, they have to collect today, I can’t have it in the flat another week. It’s disgusting. At the same time, I remember those warnings printed on the bags: put one out at the wrong time or in the wrong place and risk being fined by the city for littering. Fined quite stiffly. Of course, I reasoned with myself, they won’t impose the fine on me personally because they don’t know I put the bag out. (Unless one of my invisible neighbours is spying and reports me.) But they might fine the block of flats collectively. I looked in the brochure again and I found an Internet address and a specific statement that there is further information to be had on-line – and then a whole list of languages including English. So I went to the English language site. It didn’t load. The server timed-out. There was no connection to the site at all. I checked two or three of the other languages with the same result. The site was down. There was another URL in the brochure, one I recognised. The official site of Bruxelles Propreté. I’d been there before so I know that one works. But, not today. That site was also down. But the brochure had one more option. I phoned the telephone hotline. As ever, I found an answering machine that pressed me to choose either French or Dutch. And, as ever, I know that my chances of reaching someone who speaks English are better if I choose Dutch. I also know there will be a series of answering machine questions and numbers to press before I reach a real person, and I’ll have a better chance of following the questions if I choose French. So I chose the French site and sure enough had to negotiate a short series of other alternatives. Eventually, though, I reached a human being. Do you speak English? I ask. Non, she says. So there we are. I tried anyway to explain the situation and she tried to understand. She was extraordinarily patient and not at all rude, but she spoke back to me in French and I understood not a word. So then I tried to limp through my question in my ragged and excruciatingly limited French. I managed, I think, to explain what I was phoning about and give my address. I want to know, is this the right day? The right time? And she replied – still in French but perhaps a little more slowly – and I strained to understand. It might have been wishful thinking, but I thought she said that, yes, it was the right day, I’d done the right thing and that I should just wait. I never heard the dustcart, but when I next went out onto the balcony to check at about 18.00, the bags were gone. I was left wondering how it was possible that the entire street – as far as I could see from the vantage point of my fourth floor balcony – had no organic waste to put out for collection. Mrs SC solved the mystery when she got home. Of course everyone else just did what they always do and mixed their organic waste in with the other rubbish in their white plastic bags and put it all out at the same time as usual. Only I was Swedish enough to follow the rules. In fact, I find that comforting. It’s something I can point to should the question arise during my still on-going application for Swedish citizenship. Perhaps I should add that this week both the websites are working just fine. At home in Sweden I try to get the milk cartons flat, but certainly don’t try to fold them up. You probably shouldn’t tell your husband, but here in Belgium we have instructions (in the brochure) for drink cartons with plastic screw caps. We must rinse them out, then squeezed them with one hand while screwing the plastic caps back on with the other. Drink cartons without screw caps may not go in the blue bag. (Our milk comes in plastic bottles which also have to be closed with screw caps before we put them in the blue bags). It’s so difficult to be a good (EU) citizen! I enjoy this story! And very good of you to use the brown bag!